Seasons change… We change… But God never changes! This change is not easy but necessary. It is not just in the natural but especially in the spiritual. The worm has become a butterfly! This is our testimony! We build this our house in 1985. It was a hospital for many years. We also lived in it. Our children grew up in it. My husband and I said it many times that we shall die and be buried here. But God had other plans. In 2000 we sold the medical equipment and started a church called Father’s House Bible Church. We retired as medical doctors and became full time pastors. About four years ago the Holy Spirit directed our attention to another land to build the house of God. That included relocation. We shall live in the building of the new church. This is radical move for all but especially for me. We moved furniture, pots and pans. 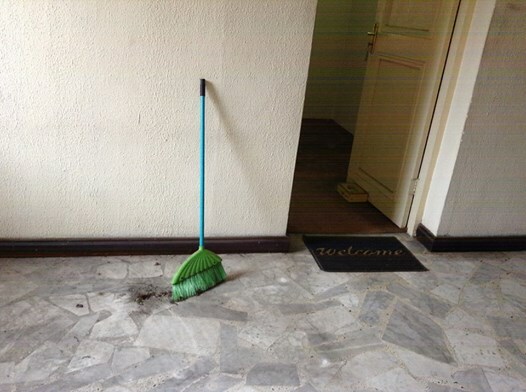 As I was sweeping today I had to say good bye to my home in Warri Nigeria, where I lived for thirty years. I shall leave this broom behind. Good bye Tombrifa close! Welcome Warri-Sapele road! This shall be our new address! It comes with new anointing! The cloud is moving and we must move with it. No enemy shall stop the progress of the church of Christ. We shall come to find rest in the new place! The presence of God leads the way! It is time to move on! The gated of hell cannot prevent or stop the move of God! There shall be progress, profit and prosperity ahead! Father’s House is blessed! Warri is blessed! May your dreams also come true! For the God who promised them to you is able to perform them! Today is my first day in my new office, in the ‘Promised Land’. God is good to me and our family, both natural and spiritual! To Him be all glory! Praise the Lord!!!!!!!!! !